steadily. Basically, “everything else” is in good shape. We should direct our attention a little bit toward Social Security and a lot toward healthcare costs, and stop obsessing about the rest. In fairness, I’d break this down a bit further. Assuming I did my sums properly, federal spending on “everything else” — that is, everything except Social Security, Medicare, and interest on the debt — has indeed gone down from 15.2% of GDP in 1962 to a projected 11.3% of GDP in 2017. (That’s from Table 3.1 here.) However, the national defense piece of that has declined from 9.2% to 2.9%, while the nondefense piece has increased from 6.0% to 8.4%. There are some arguments to be had about whether the defense piece of the budget is calculated correctly (it doesn’t include veterans benefits, for example), and it’s worth noting that healthcare costs are part of the nondefense picture too (mostly due to rising Medicaid expenditures). Still, the basic shape of the river doesn’t change much. Most of the downward slope in spending is due to lower defense spending. Domestic nondefense spending hasn’t gone up a lot, but it has gone up. This doesn’t really change CBPP’s point, it just amplifies it a little. Outside of Social Security and Medicare, domestic spending rose during the 70s and then fell, but it’s been pretty flat ever since then — until the Great Recession walloped us, anyway. We should, as always, keep an eye on it, but overall it’s simply not a major problem, no matter how many times Republicans insist otherwise. 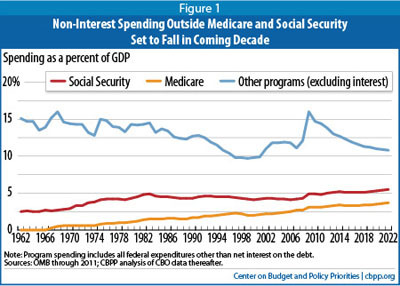 Bottom line: Social Security needs a little bit of tweaking and healthcare needs a huge amount of concentrated attention. Everything else is small beer. When it comes to federal spending, anyone who spends more than 10% of their time rabble-rousing about anything other than healthcare costs really shouldn’t be taken seriously.